I love going to races, and since I'll talk to anyone who listens, sometimes I end up making new friends! This is me and Tatum. 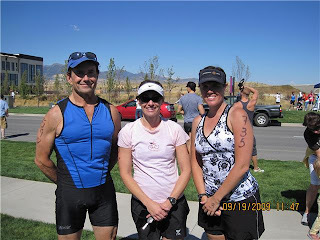 A true inspiration, it was her first tri AND she's lost 90 pounds!! She is amazing! This is Tatum, me, and Joe. 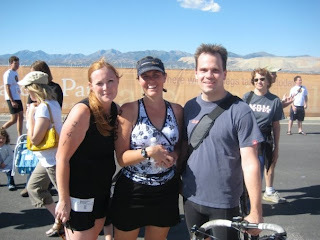 We all met before the race waiting to get on the bus that would take us to the pool. We started the race around the same time, and finished close together! 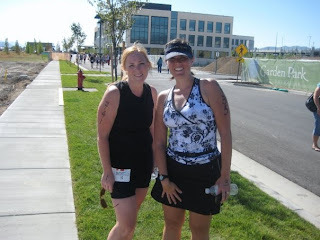 We are hoping to meet up for another tri and a 5k in November. Way to go! You did great! that's awesome you did it! whoo hoo! Congratulations Mandy! What an accomplishment! You are awesome! Mandy you look great! Way to go I could never do a tri because of the swimming. I am terrified of water.